1930 NORTON 500. Nortons have contested every Senior T.T. But it was not until their redesigned camshaft motor was introduced in T93Â° tnat tnev achieved all-conquering power. True, in 1930 the machine design was too "new" to win. But then it won in 1931, '32, '33, '34, '36, '37> '38 and again after the war in 1947, '48, '49, '50, '51, '52, '53, '54, '61â€”sixteen victories on what was virtually one engine design, steadily developed. From their Vee-twin of 1907 Nortons went to a 79x100 mm. side-valve single before World War One. After the war this model was fitted with three speeds and chain drive and then, later, with push-rod o.h.v. In the o.h.v. form it won in 1924 and 1926. Victory came to the Birmingham factory again in 1927 with a machine fitted with a 79 x 100 mm. engine, with an overhead camshaft. But this motor was not generally a winner, being beaten in 1928 and 1929 by the push-rod Sunbeams. The unit was revamped for 1930, but in the deluge on race day Walter Handley showed that he, with the good handling of his Rudge Whitworth, could outride the Norton runners. In '31 the race weather was better. . . . 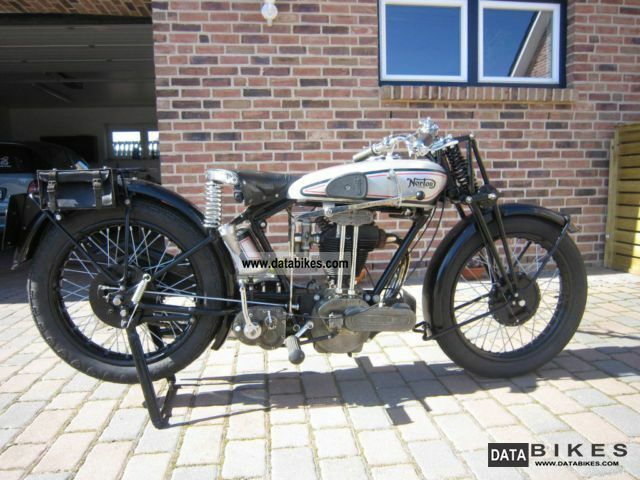 The 1930 Norton looked like a winner; its very lines suggested speed. The frame was a sturdy cradle type with three tubes running from each side of the rear wheel spindle to give great torsional strength. In fact the xame was exceptionally like the one introduced a few years earlier by eorge Broughâ€”one which had proved capable of holding a beefy ,000 c.c. motor on a path considerably straighter than its rivals. The basic Norton design, that was to remain unchanged for so long, included a very sturdy crankcase and through-bolts to hold down head and barrel. Whereas on the old camshaft job the magneto had been driven from a chain on the drive side, now a separate mag chain was fitted in a case outboard of the bottom bevel box. Oldham couplings were used on the vertical drive shaft in place of the splines of the '27 motor. (Design later went the full circle in the late fifties.) Lubrication was on the dry sump system. Coil valve springs were fitted. The 1931 race winning speed was 7790 m.p.h. by shaft and bevel gears. Ignition: magneto. Transmission: chain via three-speed Sturmey-Archer gearbox. Frame: full cradle with single down-tube and twin bottom rails to rear spindle; extra stays from rear spindle to seat pillar tube over gearbox. Forks: Webb T.T. type, with central compression spring and integral adjustable friction dampers.